COFFEE COFFEE COFFEE.. I NEED COFFEE!!! How can a headache or migraine be helped by chiropractic treatment? We’re learning that most people’s head pain seems to come from structures in the neck. The joints and nerves in the upper neck, the muscles of the upper shoulder, and the muscles of the TM joint, which is in the jaw. Those three are the keys to headache pain. But what I’ve found, as a headache sufferer myself who has been greatly helped by chiropractic, is that there are several factors involved. One is sleep. I think that the number one cause certainly of tension headaches is that people are just plain overtired. Sometimes sleep patterns have to be consistent. In other words, going to bed and getting up at the same time seems to be really important. There are other factors, such as dietary considerations. There are people whose migraines are set off by drinking a little red wine, or by eating chocolate. Everything in the human body is mediated by the central nervous system. The spinal cord and nerves are involved in every process. That’s why I think so many conditions show up in the spinal column. For instance, say you’re eating chocolate – it goes into your mouth, there are chemicals released, and there are sensory nerve endings all down the digestive tract. These relay information to the brain, and in some people those chemicals can set off a cascade of events leading to migraine attacks. So the nervous system is key in every condition, and I think that’s why chiropractic has more success than any other form of treatment for people with headaches. It’s important to emphasize that chiropractic is not a treatment of conditions. It’s a way to help the body to function better. The central nervous system (CNS) — brain, spinal cord and spinal nerves control the function of every organ, tissue and cell in the human body. If there is any interference to the function of the CNS then the body cannot function in a healthy way. Chiropractic adjustments specifically and directly remove (or in some cases reduce) interference to the CNS thereby allowing the body to function properly. Does that mean that I am saying that chiropractic treatment is “a cure for all diseases?” Absolutely not. What I am saying is that every human being is far better off from a health and function standpoint without nerve interference in their body. Do we chiropractors sometimes see patients get relief and improvement from conditions other than neck and back pain? Unequivoquely, yes! However, the intent of chiropractic is to help the CNS and therfore the entire body, to function more normally not to treat diseases, conditions or even pain for that matter. Do you see the difference? That’s why every man, woman and child should be checked regularly by a Doctor of Chiropractic – so that their body can function in the healthiest manner possible, regardless of the presence of migraines, irritable bowel or even cancer. The condition that the patient has isn’t nearly as important as the person who has the condition! One thing you have to realize about the nervous system is that it works in pathways. If that pathway has been set off a lot, then over time that pathway gets set off with less and less stimuli. In other words, if there’s a nerve somewhere in the neck that’s been irritated for years, then that nerve is what we call facilitated. In other words, it will get set off with less and less stimuli. The nervous system learns patterns. For a migraine sufferer, it will take less and less for them to get a migraine attack. So it’s the upper neck joints and nerves, and the muscles of the upper shoulder and jaw. Those are the big three. And every migraine sufferer has some combination of those, without exception. 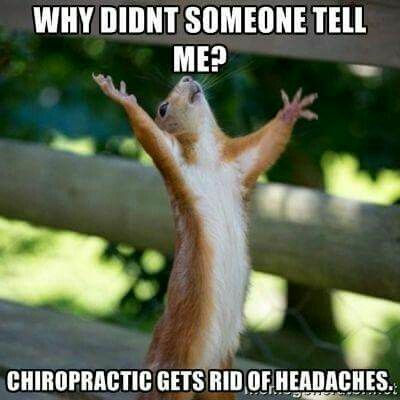 So call today 334-514-7600 and see if a Chiropractor can help you with your migraines.